Text of the 1919 bill naming “The Arizona March Song” our state anthem. 200 years ago today, Francis Scott Key penned a four-stanza poem titled “Defense of Fort M’Henry.” a four-stanza poem that would later be set to music and retitled “The Star-Spangled Banner.” The first stanza of Key’s poem was quickly set to music using the tune of an eighteenth-century British number called “The Anacreontic Song,” and was renamed “The Star-Spangled Banner.” President Herbert Hoover signed a congressional resolution designating the song our nation anthem in 1931 — thus creating a challenge for all future amateur crooners selected to sing the musically complex song at baseball games and other public events. While you’ll hear the national anthem at many types of public gatherings, you’re less likely to hear one of our two state songs. That’s right… two; one official state song and one alternate state song — neither of which are Mark Lindsay’s 1969 single. Margaret Rowe Clifford wrote “The Arizona March Song” in 1915. 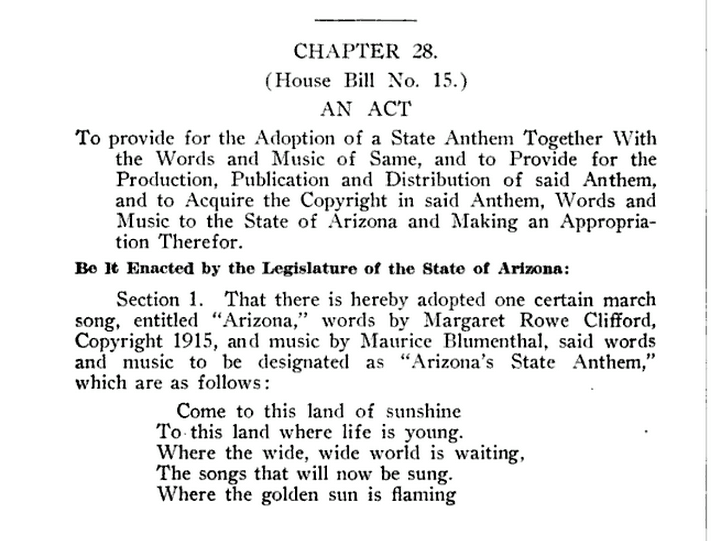 The Arizona legislature selected Clifford’s prose, accompanied by the music of Maurice Blumenthal, as our state song in 1919. Not satisfied with just one state song, a legislature more than sixty years in the future chose Rex Allen, Jr.’s “Arizona” (often known as “I Love You, Arizona”) as our alternate state song. While Allen’s song is fairly well-known today, Clifford’s 1915 piece is rarely heard. Links to renditions of both songs can be found below.